Update: More detailed info about the Bayern 19-20 third kit design has been leaked. The shirt will feature a subtle graphic print, likely inspired by the iconic roof construction of the Allianz Arena. The Adidas Bayern Munich 2019-2020 third kit is set to be released in July or August. Overall, it should be similar to the leaked Manchester United third kit. This picture shows the colors and base design of the Adidas Bayern Munich 2019-2020 third shirt. 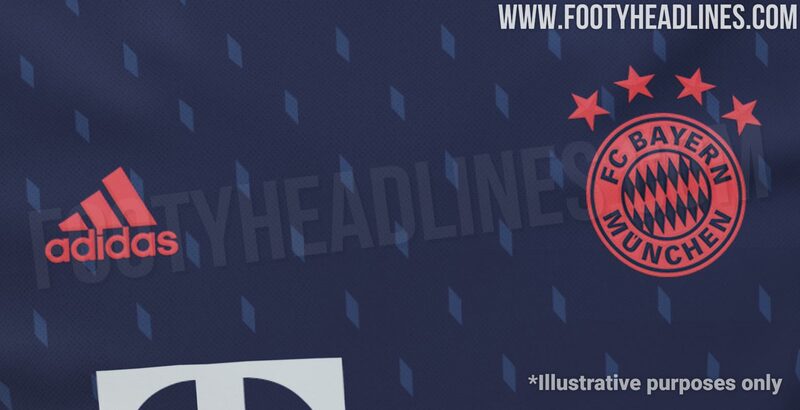 A graphic print features on the Adidas Bayern Munich 19-20 third kit. It's quite subtle and likely inspired by the roof of the Allianz Arena or the Bavarian flag. Bit će treća jer Footyheadlines zadnjih godina praktički uvijek točno objave sve garniture svih klubova.